Refer to the exhibit. 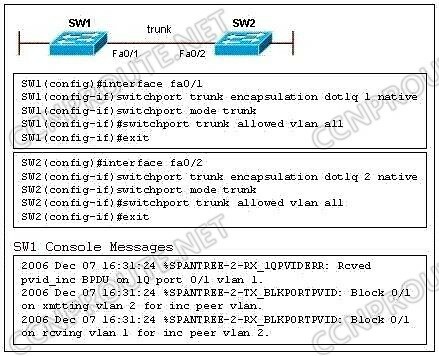 If VLAN 21 does not exist before typing the commands, what is the result of the configuration applied on switch SW1? A. A new VLAN 21 is created and port 0/8 is assigned to that VLAN. B. A new VLAN 21 is created, but no ports are assigned to that VLAN. C. No VLAN 21 is created and no ports are assigned to that VLAN. How are GLBP messages exchanged between routers that share a common LAN segment? A. GLBP messages are multicast to UDP port ID 3222. B. GLBP messages are directly encapsulated into the Ethernet data field using type code 3222. C. GLBP relies on TCP to open a connection and to maintain that connection using TCP keepalives. Refer to the exhibit. The link between switch SW1 and switch SW2 is configured as a trunk, but the trunk failed to establish connectivity between the switches. Based on the configurations and the error messages received on the console of SW1, what is the cause of the problem? A. The two ends of the trunk have different duplex settings. B. The two ends of the trunk have different EtherChannel configuration. C. The two ends of the trunk have different native VLAN configuration. D. The two ends of the trunk allow different VLANs on the trunk. A. The network 192.168.1.0 will be allowed and assigned a metric of 100. B. The network 192.168.1.0 will be allowed and assigned a metric of 200. C. All networks except 10.0.0.0/8 will be allowed and assigned a metric of 200. D. The network 172.16.0.0/16 will be allowed and assigned a metric of 200. E. The network 10.0.10.0/24 will be allowed and assigned a metric of 200. Refer to the exhibit. Which option correctly sequences the order in which a lightweight access point associates with the WLAN controller?